Since its pilot stage, VOICE has recognized the importance of assessing the impact of its flagship programs. Monitoring and evaluation have been a critical focus of the organization’s operations to ensure that quality services deliver intended results from year to year. In the past two years, VOICE has measured improvement in English and empowerment levels. In 2011, 68% of campers improved their spoken English and 63% improved their written English skills. In 2012, on the other hand, 65% of the girls improved in their spoken English skills, 72% improved their written English. In its inaugural empowerment test, VOICE reported improvement on empowerment scores of 59% of girls. Having proved the great impact VOICE is having on girls in the short-term, it’s time to design a longitudinal study to assess the medium to long-term results of VOICE programming. Through teaching marketable skills as well as encouraging girls to advocate for themselves and set goals for the future, VOICE is hoping to influence girls’ lives and decisions in their adulthood. What we are especially interested in is girls’ graduation from 10th class, moving on to higher education or participation in the workforce, as well as age at marriage and first child. Girls who completed 9th or 10th class will be contacted by VOICE staff in 6 month intervals for the first 2 years after completing camp, then annually for the next 3 years. This frequent interaction with campers will reduce the risk of losing touch with these oftentimes difficult to reach girls. As VOICE conducts control group testing in its short-term impact assessment, we will collect phone numbers from girls in the sample (with the permission of school management), with whom VOICE will also stay in touch with to observe longitudinal impact against non-campers. 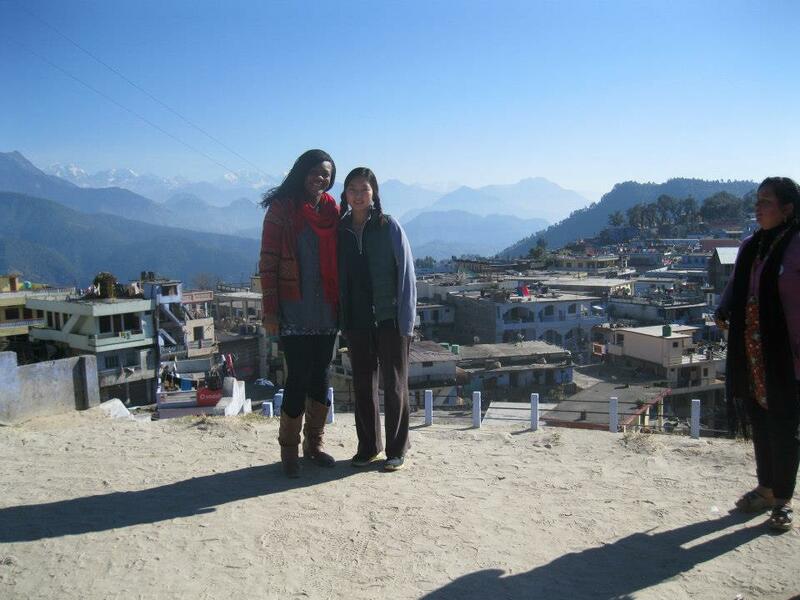 As the 2012 holiday season came to an end, Kashay, VOICE curriculum developer, and I, the young and aspiring VOICE intern, embarked on an adventurous journey to one of the most northern states of India – Uttarakhand. Also known as the “land of gods” due to a large number of Hindu temples, Uttarakhand only recently became a state, being split off from Uttar Pradesh. The entire state is located on hilly mountains, bordering Nepal and Tibet. My first mission as a VOICE intern proved to be an exciting introduction to northern India as well as our organization. Last year, VOICE expanded its programs from Hyderabad to 13 more schools throughout cities and villages of Uttarakhand. Just in time for the start of VOICE’s signature 4 week camp, Kashay and I travelled to three of the most rural villages – Didihat, Chaubati, and Jaurasi – to monitor and assess these new camps. Our journey began in the capital city Delhi. Starting from India’s busiest city, every ride led us to a more remote, rural, and mountainous place; also as the altitude went up, the temperature plummeted. Finally, one 7 hour train ride, 3 hour cab ride, 10 hour extremely bumpy bus ride, and about thousand sharp turns later, we successfully arrived in a quaint town Didihat. The town has about 5,000 people and is the closest settlement in India to the Nepalese border. As we got off the bus for the first since the last bathroom break five hours ago, we rejoiced at the open space and Gosia and Mr. Pangtey’s warm welcome. Gosia, another VOICE staff, had arrived earlier to run the counselor training session along with the regional coordinator Kiran, and Mr. Pangtey, a retired school principal of Didihat, helped implement VOICE camp in the area. Throughout the next week, Kashay and I visited four schools and attended their camps. Because it was tricky to arrange transportation from Didihat to Chapathi and Jhorassi, we only got to visit these towns once. Fortunately, we could visit two schools in Didihat multiple times throughout our stay. Even though we visited these schools only three times, we could witness girls growing more confident at each visit. For example, the first time we visited Montessori in Didihat all the girls congregated directly opposite from where we were standing, forming a semi-circle around us. We tried to engage them in a conversation and ask questions, but girls would only turn to each other, exchange awkward eye contacts, and shy away from us. Then, out of nowhere, a boy from a nearby house joined our circle and performed as a translator between us and the girls. It was interesting to note that the boy spoke much better English and was much less shy, even though he didn’t appear to be any older than girls. By the time our first visit came to an end, girls were already more open, curious, and willing to engage in conversations with us. Especially during activities and energizers, they were so engrossed and having so much fun that they didn’t even seem to notice that they were interacting freely with complete strangers – and of course, foreigners. The next two times we visited these schools, it was evident that girls were becoming more at ease and fully enjoying camp. I will always remember the way girls at G.G.I.C. greeted us; as soon as they saw us entering the school, they excitedly shouted “good morning ma’am!” and waved their hands, motioning us to sit next to them. Each and every one of these girls was like a warm ray of sunshine to me, and their innocent smiles and genuine laughter never ceased to melt my heart. Girls weren’t the only beauty in town. Everywhere we looked, the snow-capped, pristine white peaks of great Himalayas mesmerized us with their beauty and sublimity. Even though the view was absolutely breathtaking, it also meant that the weather was often below the freezing point. There was no heating anywhere in our hotel or in town, so we used every possible layer of clothing we could get our hands on to insulate ourselves. During the day, the strong sunlight was enough to warm us up, but the mornings and evenings were a completely different story. I have no doubt that VOICE can make a real impact in this area. Girls in these towns are noticeably less confident than those in metropolitan cities, and the overall quality of education is also significantly lower. However, running camps strictly in English seemed infeasible, due to the counselors and campers’ level of English. Many counselors voiced that they couldn’t fully understand the instructions for activities and that the girls couldn’t understand the curriculum content. Many also suggested that the next year’s curriculum should also include some instructions and vocabulary in Hindi. Throughout camp, we all strived to find the right balance between employing effective teaching methods and encouraging girls to step out of their comfort zones. We really thank the counselors’ enthusiasm and relentless efforts to make camp as successful as it can be at this stage. We also give many thanks to Kiran who worked fearlessly as a regional field coordinator and Mr. Pangtey and his family who really made Didihat feel like home for us. VOICE will continue to travel and bring our program to girls throughout the developing world, until their voices can be heard and respected by everyone. Go VOICE!